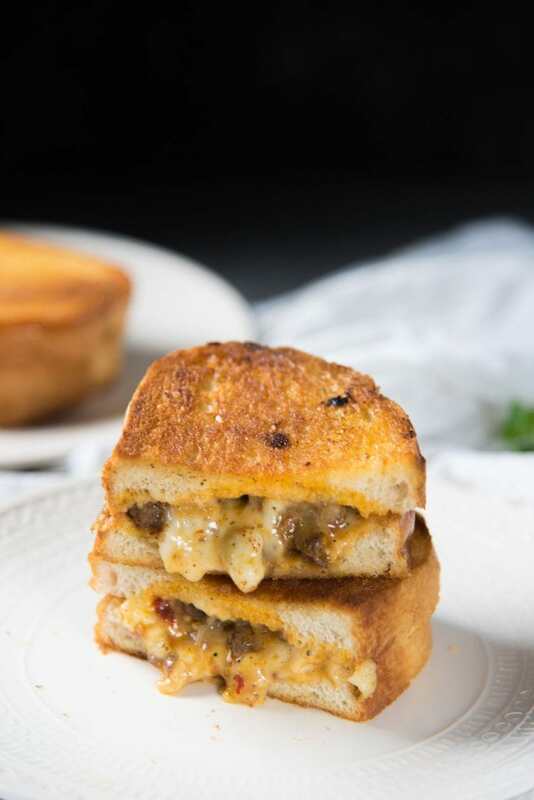 A spicy, flavorful beef curry paired with gooey, melted cheese – this simple Curried Beef Grilled Cheese Sandwich is ultimate comfort food times two! That is how Curried Beef Grilled Cheese Sandwich became a staple for me well into adulthood. A good curry is ultimate comfort food for K and I, and the combination of a spicy, flavorful beef curry with a gooey grilled cheese is pretty much ultimate comfort food squared! I used to make this with chicken for the longest time, and it’s just as good. 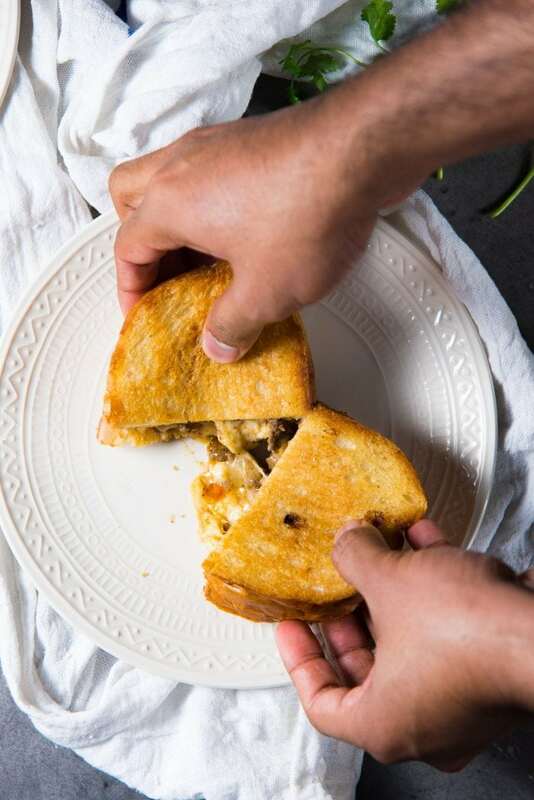 Whichever protein you choose for this grilled curry cheese sandwich, I bet you’ll flip hard for this spicy, cheesy, flavor-packed comfort food mashup. If you’re using chicken for this curry grilled cheese, make sure to use chopped chicken thighs (red meat), so that the meat won’t dry out easily, or you can also use ground chicken (or turkey). If you’re using beef (like I have here), I prefer using chuck or sirloin and then chopping it in the processor. But you can also just as easily use ground beef. In any case, I don’t always cook the meat separately just to make this curried beef grilled cheese sandwich. Most often I use leftover curry like this chicken curry here, or this spicy dry beef curry, or this peppery black beef curry. I chop the leftover chicken or beef curry, and then pan fry it with tomato sauce and some extra spices. But here, I’ll be sharing a from scratch recipe for making a grilled curry cheese sandwich instead. The curry filling is so easy and so good that you could even make this without the cheese. You could… but let’s be honest, that’s just blasphemy. The gooey cheese makes it that much better! I use a combination of pepper jack cheese and fresh mozzarella cheese for this grilled curry cheese sandwich. I love the spicy pepper jack paired with the creamy mozzarella. That combo complements the spicy curried beef really well. But you’re welcome to use any cheese you like – I recommend gouda, monterey jack, a mild cheddar, processed block mozzarella, muenster of colby. 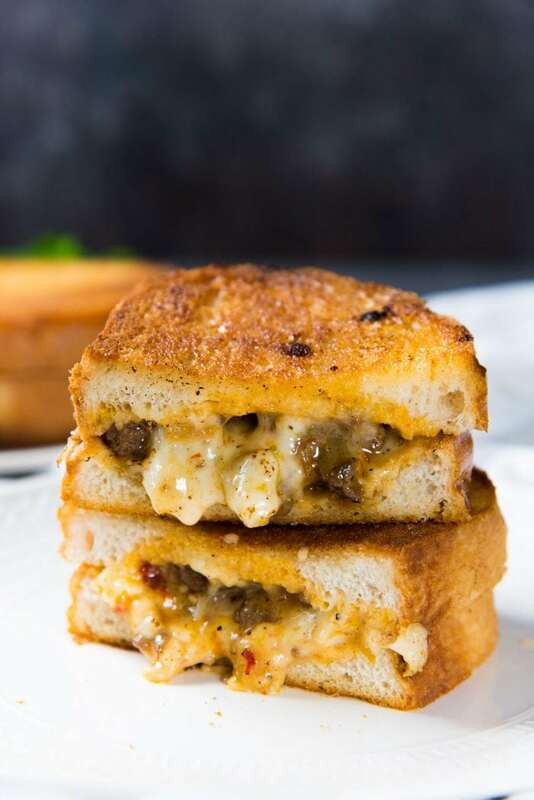 As long as you mix the cooked beef curry with the cheese at a 1:1 ratio, you should get a delicious balance of a spicy meat filling and gooey cheese for the ultimate curried beef grilled cheese sandwich (or curried chicken grilled cheese sandwich). 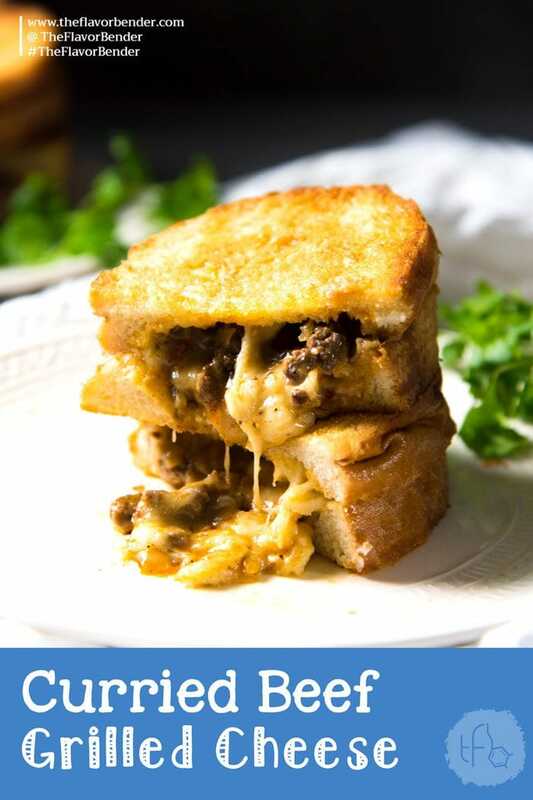 Curried Beef Grilled Cheese Sandwich - a comforting combo of curry flavors with creamy, gooey cheese. This is one epic grilled cheese sandwich! 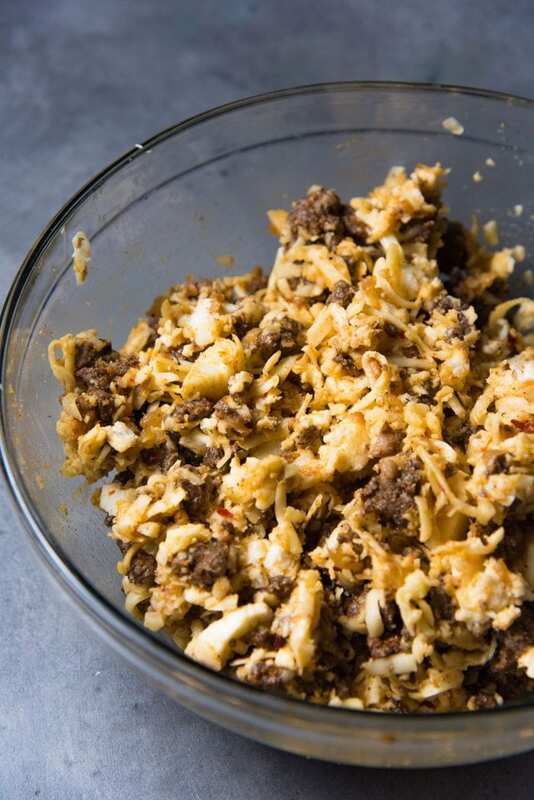 If you're using a beef cut, cut the beef into chunks and transfer into a food processor. Process for a few seconds to chop the beef into smaller pieces. Do not completely mince/grind the beef since it should only be chopped into smaller pieces. Optional - mix the beef with 1 tsp of sugar and ½ tsp of salt and let it marinate for about an hour, or overnight. Heat a non-stick skillet over medium heat. Add 2 tbsp of vegetable oil and heat the oil. When the oil is hot, add the chopped onion and roasted curry powder. Stir-fry for a couple of minutes until the onion softens. Add the chopped or ground beef into the pan along with 1 tsp sugar and ½ tsp salt (if you didn't marinate the beef previously). Add the black pepper, cayenne pepper and tomato sauce. Cook until the meat is cooked through and starts to caramelize. There shouldn't be too much oil in the mix at this point. This can take between 15 - 20 mins, depending on the heat and size of the skillet. When the beef is cooked, add the crushed chili flakes and more salt to taste. Let the meat cool down. 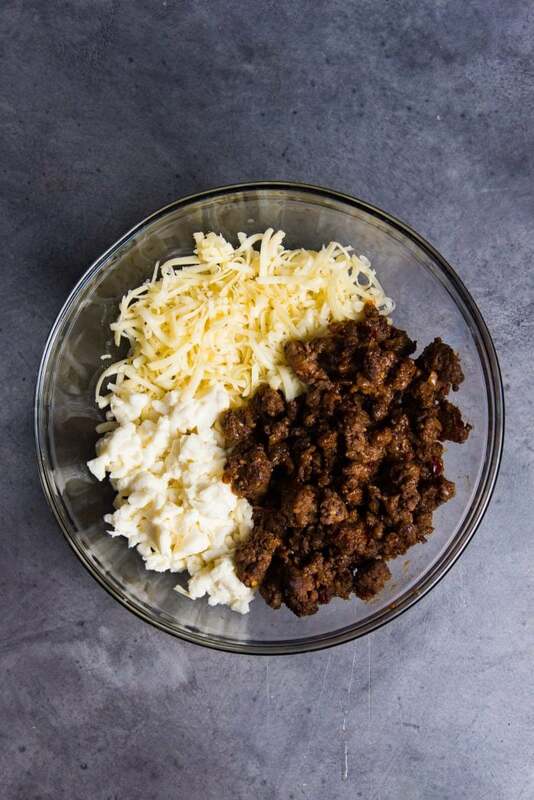 Place the two types of cheese in a bowl and add the cooked and cooled down beef curry mix. Mix to combine. Taste and add a little salt if needed. Butter 1 side of each the slices. Place the buttered side down on a heated non stick pan / griddle / cast iron pan. 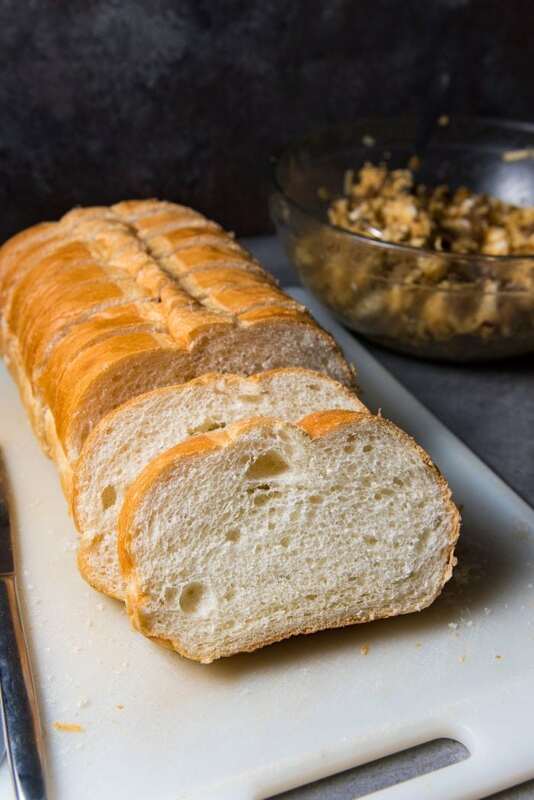 Heat for 2 - 3 minutes over medium to medium-high heat, until the surface of the bread turns a light golden brown in color. 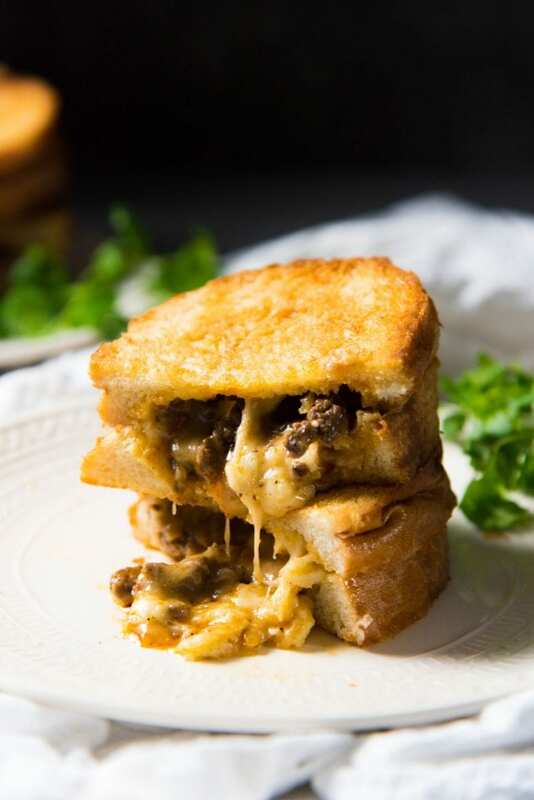 Add a generous amount of the curried beef-cheese mix on one of the slices of bread (on the toasted side), and then top with another slice of bread (toasted side facing the filling). Butter the outsides of the sandwich, and grill the sandwich over medium-high heat for 3 - 4 minutes per side, until the the bread is a deep golden brown on both sides, and the cheese is melted inside. Repeat with all the bread slices/sandwiches. Serve. 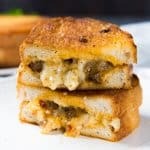 If you liked this curried beef grilled cheese sandwich recipe (grilled curry cheese sandwich), don’t forget to subscribe for new (and free) recipes by entering your email address on the side bar (and get all these recipes delivered straight to your inbox), so you don’t miss out on a thing. You can find me on FACEBOOK, TWITTER,INSTAGRAM, PINTEREST, YOU TUBE and GOOGLE-PLUS too.